Chocolate teacakes with raspberry jam are made with dark chocolate and homemade marshmallow with just a hint of raspberry. They're a scrummy British teatime treat that's sure to delight your family and friends! A few years ago, one of our dear friends gave me a yellow box of Tunnock’s Milk Chocolate Teacakes at my London-themed birthday party. Each teacake was wrapped in shiny foil and looked so pretty when you unwrapped it! Each teacake has a crisp cookie base and a marshmallow-filled dome of chocolate. I thought that these were quite unique and such a special treat. When I saw chocolate teacakes again on a baking show, I eventually decided to make them back in the fall of 2016. It was a bit of a challenge, since that was my first-ever time tempering chocolate. 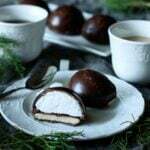 The teacakes tasted good, but I had a lot of white patches on the chocolate domes. That meant that the chocolate had bloomed, which was a fault in my tempering process. If yours do that, don’t worry! They’ll still taste fantastic. I encourage you to give this recipe a try. It’s a lot of fun to make, and is so rewarding to enjoy with a cup of tea. I like the hint of raspberry that comes through from the jam, as it really complements the dark chocolate. Yum! 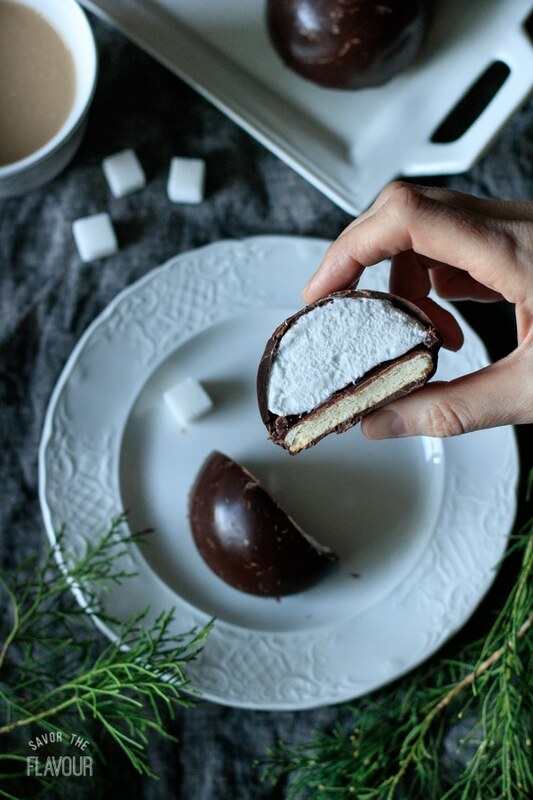 Chocolate teacakes with raspberry jam are made with dark chocolate and homemade marshmallow with just a hint of raspberry. They’re a scrummy British teatime treat that’s sure to delight your family and friends! Combine the flour, baking powder, and sugar in a small bowl. Rub in the butter with your fingertips, then stir in just enough milk to bring the mixture together into a dry dough. Roll out the dough to about 1/8-1/4 inch thick and cut out at least six circles with a 3-inch cookie cutter. Transfer the cookies to a metal cookie sheet and chill in the fridge for at least 15 minutes, but up to overnight. The chilling is crucial because it helps prevent the cookies from shrinking or spreading in the oven. Preheat the oven to 325 F. Bake the cookies until they are crisp–about 10-12 minutes. You want to hear the cookie snap when you bit into it. Place 10.5 ounces (300g) of the chocolate in a stainless steel mixing bowl and set over a pan of gently simmering water. Stir the mixture constantly until the chocolate has melted. Don’t let it go over 120 F with a candy thermometer. Remove the chocolate from the heat and gradually mix in the remaining 3.5 ounces (100g) of chocolate, stirring until it’s fully melted. If the chocolate isn’t melting easily, put it back over the simmering water for a few seconds, stirring constantly. Keep the chocolate’s temperature below 120 F.
Take the chocolate off the heat and stir it until it reaches 82 F.
Put it back over the simmering water and heat it to 88-91 F, stirring constantly, then remove it from the heat and let it cool to 84 F, stirring frequently. Test the chocolate by smearing some on a piece of parchment paper. The chocolate should dry within several minutes without any streaks or white patches. If there is any white discoloration, this means the chocolate has bloomed and the chocolate must be re-tempered to eliminate the bloom. Once the chocolate is in temper, line a 6-cavity, half-dome silicone mold with the chocolate. Do this by spooning some chocolate into a cavity and spreading it evenly with the back of a spoon. Work fairly quickly before the chocolate sets. Be careful not to let all the chocolate run into the bottom of the mold, creating a thick base and thin sides. Set aside the mold to fully set. Coat the 6 cookies with the chocolate and set them aside to set on a piece of parchment paper or a silicone baking mat. Set the remaining chocolate aside for later. Pour the cold water into a small stainless steel bowl and sprinkle the gelatin powder evenly over its surface. Let stand for 5 minutes without stirring, then set the bowl in a pan of simmering water and stir until the gelatin is fully dissolved. Set aside. Crack the egg whites into a large stainless steel mixing bowl, making sure no flecks of yolk are in the whites. Set aside the yolks for another use. Add the caster sugar and salt and set over a pan of simmering water, making sure the bottom of the bowl doesn’t touch the hot water. Use a handheld electric mixer to beat the mixture until frothy. Add 7 teaspoons of the gelatin mixture and continue to whisk on high speed for about 8-10 minutes, until the mixture is quite stiff and pipeable. The mixture should be forming fairly stiff peaks when the whisk is lifted from the mixture. Spoon the mixture into a large piping bag fitted with a 1 centimeter round tip. 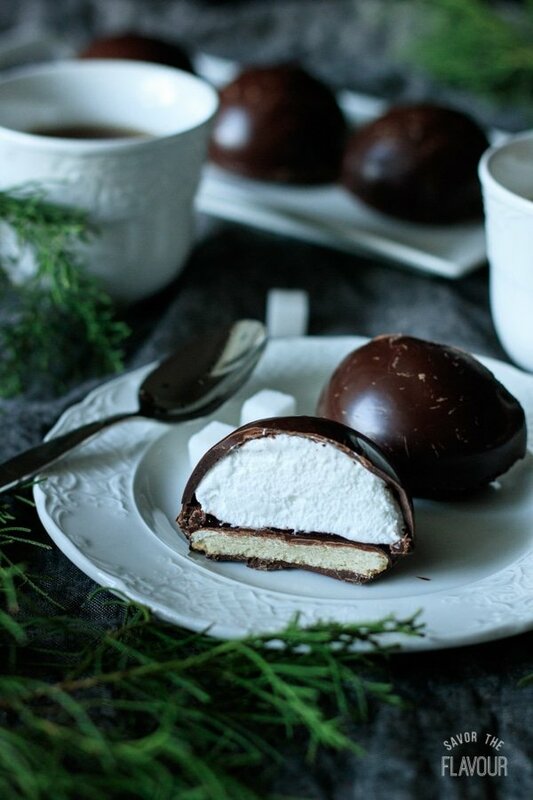 Fill each hardened chocolate dome about 4/5 full with the marshmallow, making sure to get all the way to the edges. Be careful not to overfill the domes. See the recipe notes for a tip on using leftover marshmallow. Set the bowl of tempered chocolate back over the pan of simmering water and stir until mostly melted. Remove from the heat and stir until fully melted, then pour the chocolate into the corner of a plastic sandwich bag. Twist the top to form a piping bag and set aside to cool for 5-10 minutes, but don’t snip off the corner yet! Spread 1 teaspoon of raspberry jam on the ugly side of each chocolate-covered cookie. Snip the corner off the piping bag and pipe a circle of chocolate around the edge of the marshmallow domes. Quickly place a cookie jam side down on top of each marshmallow-filled dome and seal the gaps with more chocolate. Let the teacakes fully set, then remove them from the mold by carefully peeling away the silicone mold. Don’t touch the shiny dome, or it will get fingerprints on it. 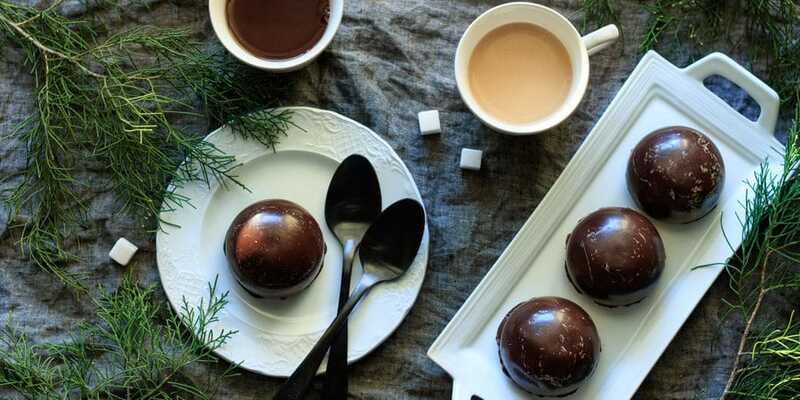 Serve the teacakes at room temperature with a cup of tea. Make sure to store the teacakes in a cool, dry place, but not in the fridge. Refrigeration will ruin the chocolate’s glossy finish and may cause it to bloom. You will need a 6-cavity, half-dome silicone mold for this recipe. Leftover cookies taste wonderful with extra chocolate and raspberry jam. Any remaining marshmallow can be spread in a parchment-lined loaf pan and let dry at room temperature for several hours, then refrigerated. It can be used as mashmallows in hot chocolate or Rice Krispie treats.